One in 10 Americans will have a kidney stone at some point. Here's the lowdown on symptoms and causes as well as a range of kidney stone treatment options. At times, we can pass small kidney stones, albeit with some discomfort. In sever cases, kidney stone treatment can involve an ER visit and hospital stay. A kidney stone is formed from substances that are present in urine. Usually these substances are excreted from the body in urine, but if you don’t drink sufficient fluids, they can crystallize and clump together to form tiny stones, creating a sometimes urgent need for kidney stone treatment. Some kidney stones pass by themselves, but others, if large, require medical treatment, as we discuss below. First, kidney stone basics…. The most common type of kidney stone forms when calcium combines with oxalate, a compound present in some foods (for example, some fruits and vegetables, nuts, and chocolate) and also manufactured by the liver. You may be at risk for a calcium oxalate kidney stone if you eat a diet that is high in protein or sodium (salt), since these both increase levels of calcium and oxalate in the body. Having an inflammatory bowel disease, such as ulcerative colitis or Crohn’s disease, or having had gastric bypass surgery also increase calcium and oxalate levels, since they affect the way your body digests these substances. Obesity and a medical condition called hyperparathyroidism also raise your risk for this type of kidney stone. Uric acid—the substance that can build up in the joints to cause gout—is another substance that can crystallize to form a kidney stone. Uric acid can build up in the body naturally, or due to the consumption of too many foods that cause kidney stones—specifically those that are high in purines, substances that the body converts into uric acid. 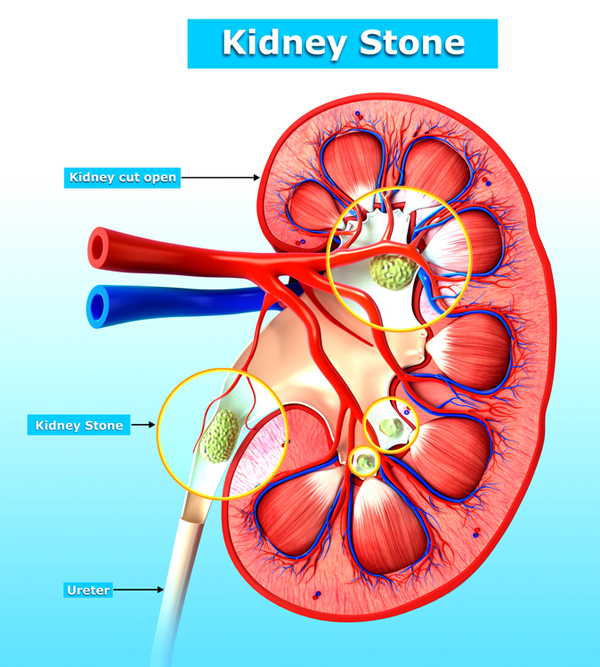 Struvite (which can build up in the urinary system if you have a urinary tract infection) and cystine (which can build up in people who have a health condition called cystinuria) also can cause kidney stones, although these types of stones are rare. Pain. This may be severe, starting in your side and back, and radiating to your groin area. 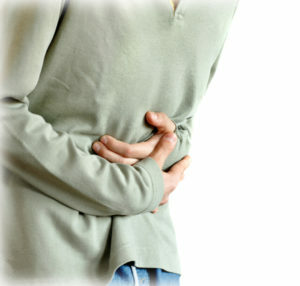 The intensity of kidney stone pain may ebb and flow as the kidney stone moves. Frequent urination. You will likely need to urinate more often than usual, but urination may be painful, and you may pass only small amounts. The urine may be cloudy, pink, or brown. Fever. You may develop a fever and chills. If the pain of a kidney stone is severe, you notice blood in your urine (it will look red), you find that you cannot pass urine at all, you experience nausea and vomiting, and/or you develop a fever, immediately contact your doctor or go to your local emergency department for kidney stone treatment. Blood and urine tests, along with X-rays and computed tomography (CT) scans can be used to diagnose kidney stones, but only large stones require treatment. Smaller kidney stones typically pass by themselves, though this can be painful. Drinking plenty of water can help flush the stone out, and over-the-counter pain relievers should help ease some of the discomfort. Your doctor also may prescribe medication that relaxes the ureter so that the stone can travel through it more easily. If a kidney stone is large, it may need to be removed. This can be done using sound waves that break the stone up into smaller fragments that can then be passed via the urine. This procedure can be painful so you will likely be sedated for it. A keyhole surgery procedure called percutaneous nephrolithotomy can be used to remove particularly large kidney stones via a small incision in your back—this requires general anesthesia and a couple of days in the hospital to recover. Another method of removal involves using an instrument called an ureteroscope, which is inserted into the urethra and on up through the bladder into the ureter. As with percutaneous nephrolithotomy, you will need a general anesthetic if this method of removal is used to treat your kidney stone. Once your kidney stone has passed or been removed, your doctor may recommend further treatment, depending on what caused the stone. You may be prescribed a thiazide diuretic to help lower the risk for calcium-oxalate kidney stones, and you also should avoid taking calcium supplements (see below). Medications that reduce uric acid levels may be prescribed if your kidney stone was uric-acid based—another medication can be given to help prevent cystine stones. Antibiotic treatment may be advised for struvite kidney stones. Drink sufficient water. If you’ve had a kidney stone in the past, it’s one more reason to stay hydrated, so your doctor may recommend you aim to pass about 2 gallons of urine per day. The color of your urine can be a useful clue: it should be clear, not yellow. Drink freshly squeezed lemon juice.. Why? Lemon juice contains a chemical that can help prevent kidney stones from forming. Cut back on salt. Most Americans consume far too much salt, so try to monitor how much you’re getting via foods in your diet. Keep in mind that bread, cured/processed meats, canned soup and beans, soy sauce, pickles, and sauerkraut are especially high in salt. Check product labels and opt for low-sodium versions when you can. Ease up on the meat. Red meat especially is high in protein. Try to boost your protein intake by consuming more legumes (beans, lentils) and less red meat. Avoid foods that are high in oxalate. Oxalate causes many common types of kidney stones. Oxalate-rich foods include dried apricots, figs, kiwi, plums, rhubarb, spinach, swiss chard, beet greens, collard greens, eggplant, leeks, celery, green beans, rutabagas, sweet potatoes, summer squash, barley, wheat germ, bran, almonds, cashews, peanuts, pecans, hazelnuts, nut butters, tahini, sesame/poppy seeds, soybeans, tofu, miso, soy milk, black tea, green tea, chocolate, cocoa. Don’t avoid calcium—you need it to help your body excrete oxalate. However, you should aim to get your calcium via food and not from supplements, which are associated with a greater risk for kidney stones. almonds, black tea, bowel disease, calcium, chocolate, diet, diuretic, food, foods that cause kidney stones, gout, green tea, health, infection, inflammatory bowel, inflammatory bowel disease, kidney stone diet, kidney stone pain, kidney stone treatment, kidney stones, milk, natural remedies, natural remedies for, natural remedies for kidney stones, nuts, obesity, pain, pain relievers, potatoes, protein, purines, reduce uric acid, rhubarb, sauerkraut, soy, soy milk, spinach, supplements, thiazide, ulcerative colitis, uric acid, vegetables. When I read this article, I just remembered that my grandmother was treated for having large kidney stones just last year. The doctor then advised her to have dialysis every day to keep her kidney functioning well. Due to the treatment, I will be looking into alternate options online as to how to bring the treatment to her home so as to let her get as much rest as possible.